Sherbet colors. My favorite. I covet and hoard old sheets that look like summer did on my old block. Across the street lived a family with three beautiful hippie sisters. Tana, Kiki, and Mimi. The youngest was at least five or six years older than I was. They all looked like what you wanted to look like: long, blond, halter-topped, big-toothed, always laughing, always coming or going, never there for as long as you would've liked; you waited to see them, and hoped they might give you the time of day. Sometimes they did, and that kept it going. We were afraid of them, because they put on scary plays on the front porch and had lots of inside jokes and couldn't have cared less about us. They built a house for their cat, which lived outside, and when the family moved they just left him behind, and he became ours. That was Spot, who lived for years and years afterward. That's what I think of, when I look at these fabrics. Sleeping-porch fabrics. Humidity fabrics. 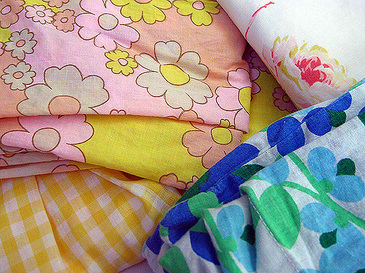 Nightgown fabrics. A party across the street. Braids and daisies. Bare feet. Oak trees. Sagging screens. Playing tennis alone for hours against a wall. How sunburn bloomed at night. Smashed lightning bugs streaked across the driveway. Someone yelling something to somebody. Longing. How we wished it would rain, but only in big, booming downpours that would flood the viaduct. We'd go sit on the fence and watch cars drive through. Some would go too fast, spraying dirty water like enormous gray wings. What a great post. As I was reading it I kept thinking of that movie Virgin Suicides...not because it made me think of, well, suicide, but the description of the girls..the sisters. I always wonder if my kids...the kids of today...will have memories like this. Such simple, sweet thoughts about how they just WERE...not busy with a Gameboy or being shuffled to dance or some activity. Not only do we think fondly of doing such simple things such as that as little kids, we actually enjoyed them at the time. Or at least I did. Kids now would be bored to tears just hanging out on a porch watching it rain. I loved nothing more than going out and walking in wet summer grass on a late afternoon...laying down in it if it was really hot. Just being. Ok, I think someone has spring fever big time, lol. And you were just loving all the snow! I'm ready too...I'm ready to plant and be outside until it's so hot that I have to hibernate inside until fall (live in the south). Now I'm wanting some of those sheets! Btw, I'm a new reader to your blog and a big fan of your style. I just bought a Granny square afghan off Ebay after all your talk about your blanket, lol! And I've been on the lookout for the issue of Romantic Homes. You have great style...and great memories. I'm in Tennessee, and it is 18 degrees here this morning. Your post made me nice and toasty! We had a lot of those same sheets at my house. I'm gonna call my mom and see if she still has any of them. On our street it was two brothers carrying the hippy torch. Russell, the elder, had long hair and a peculiar way of walking. He basically bobbed up and down, and his hair waved behind him. I always wondered who taught him to walk that way. Did he think it was cool? Robby, the younger brother, was a maniac. He would build soap box cars and then figure out the riskiest way to smash them up in some kind of collision. We watched some doozies. No matter how terrible the crash, he would always get up as if nothing had happened, as if he hadn't almost died in a freak run-in with the curb. the memories that they evoke. Ahhhh...sleeping porches! Wow, I thought I was the only one in Chicago with one of those. I "moved in" to the porch every summer, when it was still a bit too cold, and waited to "move out" of the porch every fall, when it was a bit too cold....I hated leaving that porch. You have expressed some of my BIGGEST, most important memories of being a child, right here, in your own words. Thank you! Nice visuals - in words and photos. Perfect summer dreaming for these cold, snowy days. those colors and patterns are making me all giddy. 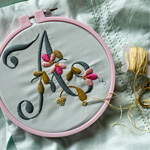 this post is lovely both to look at and to read and remember simple pleasures. thanks! I am usually a lurker and don't comment, but I just loved this post. It was so well done. It made me so nostalgic for my youth. Thank you thank you. your summer memories. I remembered things I hadn't thought about in years. I could smell summer from twenty-five years ago for a moment. It was nice. It also strengthened my resolve to give my kids a simple life that does not revolve around insanely organized group activities. Sometimes I panic and buy a ridiculously expensive electronic toy or start looking into toddler cooking classes (there really are such classes) just to keep up with everyone else. Thankfully little things like your post or watching my two girls spend an entire morning building "A Fair" out of the couch cushions remind me that I never belonged to a playgroup and I never owned a video game but I had a ball when I was a kid. Thank you. and i have most of those sheet, too. and i like them for very similar reasons. Love it! I have been collecting sheets from thrift stores lately for similar reasons. My grandmother always had beautiful sheets that sounded like flags flapping as she made the bed each day. Why is it with all of the imported cotton and lofty thread counts, sheets today have nothing on those of yesterday? Lovely post. Another displace midwesterner (now in Boston)chiming in! I saw the pictures of your fabrics and was immediately flooded with memories of my grandma's linen closet and summers with my older, much cooler, cousins. Oh, and don't forget watching the fireflies come out at dusk! I think every neighborhood had at least one of "those" girls and every little girl wanted to be her. In mine, her name was Diane. You captured the essence of childhood so perfectly... carefree, warm and simple days, mixed in with the beginnings of being left out and quietly wishing. Beautiful entry. Thank you for sharing, and connecting me with my own childhood memories of summer. How could you bother to build a house for a cat but don't take it with you when you move? It boggles the mind! OH my gosh!! AMy J and I had the same thought!! Your description of the sisters not letting others in their circle immediatly brought Virgin Suicides to my mind too, scary huh? 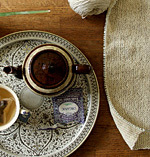 Ooh, my heart gave a little twitter of love when I clicked and first saw that top fabric picture. I love them too and I collect them whenever I can find them. I especially love sheets with grassy fields and flowers! Why don't they make colorful sheets like that anymore? I am, in fact, making a skirt out of a pink/yellow/hot pink vintage pillow case right now. Sweet post. Oh, man. Lemonade here, and dogeared paperbacks, and no sense of time-- each day suspended in amber until it ebbed into the long twilight. Can I really give this to my boys? I hope, I hope. . . Strange how the smallest of things can trigger a flood of memories - sweet.